ALERT: Restore One flood water removal and flood water repair teams are on the ground and standing-by in Houston, Texas, and the surrounding areas. Trust the experts with decades of flood water removal and repair service experience in Houston and the surrounding areas! Call 877-737-8673 for service today. 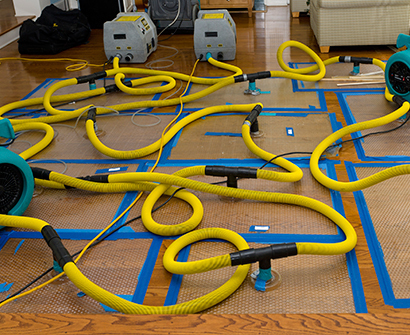 The repercussions of extensive flooding or water damage can be overwhelming. Whether clean water from a ruptured water heater or contaminated water from heavy rainfall, a water or flooding event can cause extensive flood damage that often poses immediate health and safety concerns. In any such event, Restore-One will be there with an immediate response to recover and repair all water and flooding damages so that your home or property will be like new. Water damage and flood damage are two distinct crises that require entirely different restoration processes. While a water damage event is traditionally defined as one caused by ‘clean water,’ a flood damage event is one caused by potentially contaminated water from heavy rainfall, creeks, or rivers. As such, a flooding water damage event requires thorough cleaning and repairs of any physical damages caused by the flooding water. However, a flood damage event requires cleaning and remediation according to the strictest protocols and procedures, ensuring the health and safety of family or employees is never compromised.The EPA writes, “During a flood cleanup, the indoor air quality in your home or office may appear to be the least of your problems. However, failure to remove water and contaminated materials and to reduce moisture and humidity can present serious long-term health risks. Standing water and wet materials are a breeding ground for microorganisms, such as viruses, bacteria and mold. They can cause disease, trigger allergic reactions and continue to damage materials long after the flood.”Restore-One boasts considerable experience with both water damage and flood damage, having successfully responded to and remediated water or flood damaged properties for more than two decades nationwide. With our experience, knowledge, and dedicated team at your side, you can rest easy knowing that your water or flood damaged property will be handled and restored with complete care for all facets of the process.